Neighbourhood Watch is a long-standing community based program aimed at encouraging neighbours to work together to reduce crime and make their communities safer. Neighbourhood Watch partners with local governments and the wider community to create networks, educate the public on home-safety and provide a platform for the WA Police Force to link with local communities. 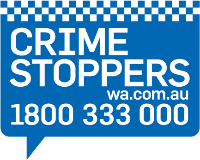 For more information email Neighbourhood Watch, call 9222 1513 or visit Neighbourhood Watch website. A lot of what we see and hear is information that can be shared with police for evaluation, research and to assist with inquiries. Neighbourhood Watch is about creating a network of neighbours who look out for each other and their environment and report suspicious activity to police. Download the printable reporting form for your business or group.